The dreaded tax season is behind me (although I admit I do love it, I also love it when it is over, heh). I survived and so did you, woo hoo! 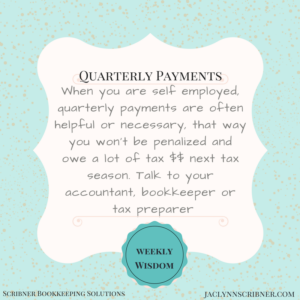 Quarterly payments hurt a lot less than shelling out the big bucks all at once. And it keeps you out of penalties if you are self employed (as most entrepreneurs are!) and owe more than $1k. Quarterly payments are easy to start. Check out the forms to download and send in or file them online! Comment below and let me know if you file quarterly payments or if you are going to start doing this.